Is Microsoft's wonder toy the next step in the evolution of the PC? Your work as an IT professional never ends. When you're not poking your head behind a patch panel, tackling a list of troubleshooting tickets, or translating napkin drawings into a real project, you've opted to spend some of your free time nosing through resource kits, exam guides and other resources to bone up on a Microsoft exam. Then, some of you have families that take up what time is left. With the few moments that remain after all that, why would you choose to play video games? Past history dictates that I should not own another gaming system. I say this based on my propensity to remain enraptured for hours into the early morning, trying to attain one more conquest, rescue or kill. I resisted up until a few weeks ago. With my will broken, I went online and purchased a Microsoft Xbox. It's no secret that Microsoft's hyped up entry into the video gaming niche competes directly with Sony PlayStation 2 and Nintendo GameCube, but the offer was put in front of me to explore the Xbox's potential as a networked, broadband-ready home computing device. That the Xbox's innards are on par with my circa-1997 home PC and has potential for being customized is worth exploring even further. 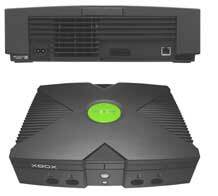 The basic Xbox comes with the typical components you'll find on its competitors: a console with a media tray, a controller and RCA-style cables for hooking up the unit directly to a TV. The console has slots for four controllers on the front of the unit, plus a 10/100 Ethernet port slot on the back of the unit to accommodate broadband access. Microsoft just completed successful beta trials of the Xbox Live service, which the company plans to launch this summer. Figure 1. Xbox console, back and top-front. The back view shows the 10/100 Ethernet port to the right, for broadband-ready gaming, due later this summer. Inside the unit is a 733MHz Pentium III paired with a 233MHz nVidia graphics processor chip; 64MB RAM; a DVD drive, and an 8GB hard drive. Only about two gigs are taken up by the machine's applications and processing, which leaves nearly 6GB for saving game progress. You can save your game progress and make it portable using an optional memory unit, which slips into one of two slots on the front of the controllers. Table 1 shows the configuration of the Xbox, compared to other gaming systems and a typical PC. Other optional accessories include an HDTV cable, wheel/foot pedal controller, and DVD playback unit. Table 1. Comparing a home PC to the top three gaming consoles. a. This is my circa-1997 PC at home. This might not be your PC, but then again I only make an editor's wage. Prices are shown circa 1997; a comparably equipped 2002 PC for approx. $800 might include an Athlon XP Processor, 256MB RAM, 40GB hard drive, and DVD-ROM. While the Xbox closely resembles a PC in many ways, a Microsoft spokesperson dismissed this comparison emphatically: "It's first and foremost a gaming console." What makes the Xbox slightly better is that it actually boots up and load games quickly—PCs still can't do that. Xbox isn't a PC nor is it intended to replace one, but, then again, a shoe is not a hammer. All of this sophisticated hardware in such a small case for a mere $299 U.S. retail hasn't gone unnoticed by folks prone to attempt a reverse-engineer of the Xbox's mystery operating system (rumored to be a stripped down Windows 2000 kernel) and security-hardened hard drive so that it can be turned into an inexpensive PC. For one thing, the Xbox hard drive isn't so security hardened as to be impenetrable. One Xbox feature lets you copy music tracks from your favorite CDs to the hard drive, which means the potential for loading software and applications exists. If Xbox isn't the evolution of the inexpensive PC, perhaps the rumored HomeStation is. This, according to Prudential Securities analyst Hans Mosesmann, as reported in EBN.com. In an article entitled "Microsoft reported to ready all-in-one home gateway," Bruce Gain reports that Mosesmann sees hints in Microsoft's partnerships at a convergence of technologies that may evolve into HomeStation, a PC-type unit that combines traditional computing functions with gaming, a high-end audio receiver, superior graphics, and broadband capabilities. Asked to verify Mosesmann's findings, a Microsoft spokesperson says that the rumor is "erroneous." Nonetheless, Mosesmann is onto something: a PC as inexpensive and as easy to set up and use as a gaming console for your average consumer. If Microsoft does as he predicts, perhaps "a HomeStation in every living room" might become the new Microsoft mantra. Even more useful is the idea of networking beyond games. The Xbox's Ethernet port is useless at the moment, but Microsoft plans to render networked, multi-user gaming revenue from it in late summer. 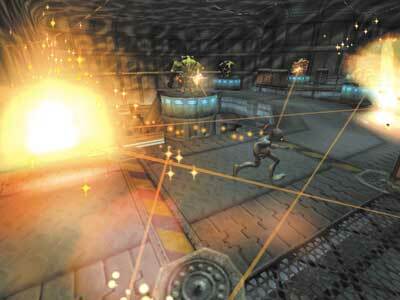 Networked games aren't some new Microsoft innovation, just an outgrowth of existing networked PC gaming. In much the same way that PCs can be peer networked, there exists the potential of peer networking dozens or hundreds of reengineered Xboxes, at a much lower cost per unit than even cheap Pentium III-based PCs. The Xbox as inexpensive Linux box or peered networking machines are mythical ideas at the moment. Another one is that Microsoft will make strides in future versions to make it resemble a PC functionally. Microsoft has denied media reports suggesting that the company has plans in the works to do so (see "Supersize It"). group=microsoft.public.xbox if you don't have a newsgroup reader). Microsoft Xbox, plain and simple, is a well-designed, easy-to-set-up gaming console that lacks depth in its game offerings. With just one game, I find that I'm easily addicted and have even reassessed my TV viewing habits to include at least an hour or two on the Xbox. The gaming niche has room enough for another competitor, it seems. But there's potential inside the box, if Microsoft can be nudged to turn it into an affordable, networked computer for the masses.